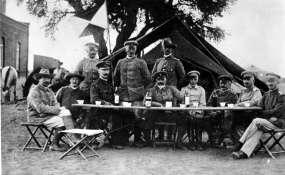 German troops in Keetmanshoop during the Herero uprising in 1904. A US court has dismissed a compensation lawsuit lodged against Germany by two Namibian tribes for genocide and property seizures in colonial times. New York lawyers for Herero and Nama will appeal the ruling. Herero leader Vekuii Rukoro asserted Thursday that New York federal judge Laura Taylor Swain had made "fundamental errors" in dismissing the case, adding that lawyers for the tribes would lodge an appeal "with immediate effect." In the early 1900s, colonial troops killed tens of thousands of protesting Nama and Herero outright or expelled them to their deaths in the Omaheke desert region within what was then known as German South West Africa under an "extermination order" issued by colonial German General Lothar von Trotha. Swain in her 23-page judgment dated Wednesday ruled that the principle of sovereign immunity made the case against Germany inadmissible. The tribal plaintiffs had argued that immunity was overridden in cases of property taken in violation of international law and when a "direct effect" on US commerce was established. The plaintiffs had cited the presence of victims' bones sold by the wife of a German anthropologist to the American Museum of Natural History. "We are determined to see to it that this decision is reversed on appeal and that our claims for reparations shall proceed," Rukoro told a news conference. "It is a merely a temporary setback in our journey and in no way the end of the struggle for us," Rukoro added. The ruling was predictable, said Germany's legal representative Ruprecht Polenz, a jurist, veteran Christian Democratic Union (CDU) politician and former Bundestag foreign affairs committee chairman, who since 2015 has led negotiations with Namibia's government over the colonial past. "That's why we've always said that it's not a legal but a political-moral issue," Polenz told the German news agency dpa. The New York ruling could have a "clarifying effect," he told the German Catholic news agency KNA. Polenz said further talks were planned for April. "I hope that we will soon come to a settlement," he said, adding that the goal was to provide substantial development aid to "heal the still existent wounds." He told Bavarian BR public radio last August that aside from its political-moral aspect Germany saw "no legal obligation because at that moment in time [in former German South West Africa] there was no legal framework that one could apply." During World War One, then-imperial Germany lost colonial territories in what is now Namibia as well as in what are now Tanzania, Samoa and Papua New Guinea. In South West Africa -- held since 1884 -- German colonial troops surrendered to British forces in July 1915. At the time the colony had 14,000 European settlers of which 12,000 were German. In 1985, a United Nations report described the German colonial acts in Namibia as genocide, prompting a 2015 German acknowledgement of "moral responsibility." Germany has, however, avoided a formal apology and facing Herero and Nama demands for the return of artifacts began in recent years to hand back remains. In early January, Hermann Parzinger, a leading German museum curator, said a memorial space for crimes committed by Germany in colonial times should be included in Berlin's new Humboldt Forum complex.